I think I said this last year too, but we're not really big Valentines Day celebrators around here. We'll maybe go out or do something fun but not really into the gifts or anything extravagant like that. More often than not we'll stay in make something fun for dinner together. I know though that others out there love to celebrate and love to find anything and everything Valentines. 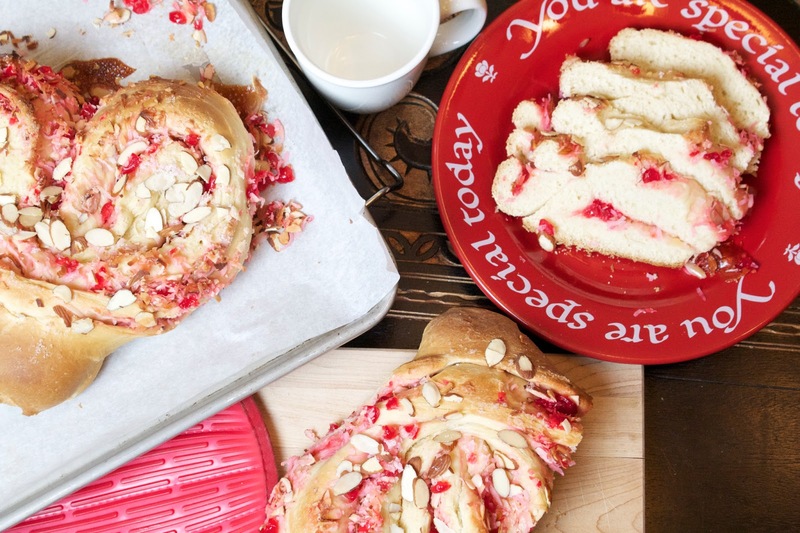 If you want to do something a little different this year, I've got this great bread from Red Star Yeast that you can make for breakfast the day of, or make it the weekend before for a special pre-Valentines day kickoff. It's a heart. I mean what else could you ask for if you want something to scream Valentines day. 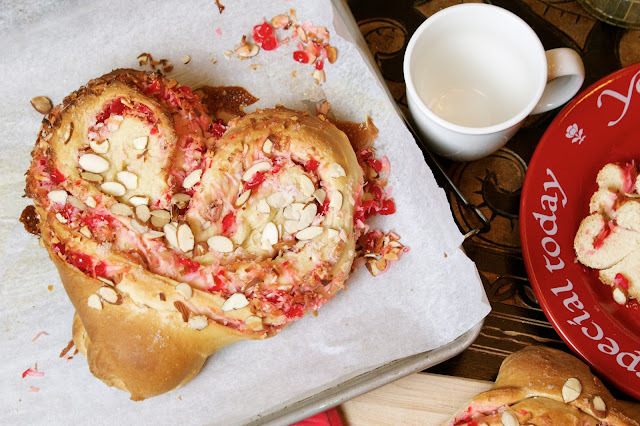 This bread is a lot of fun to make and it creates a beautiful shape that's sure to score you a few extra points with that someone special. 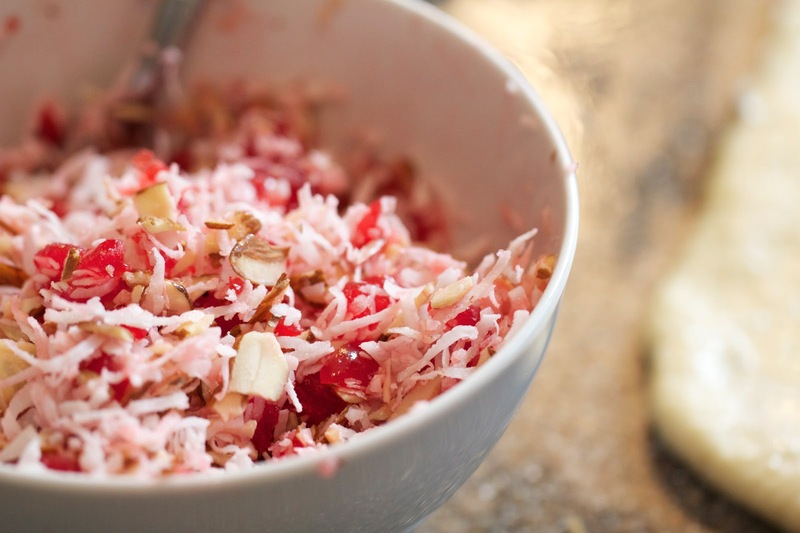 The filling is fun and a bit different than usual with cherries and coconut but you could also always do a cinnamon and sugar filling too. 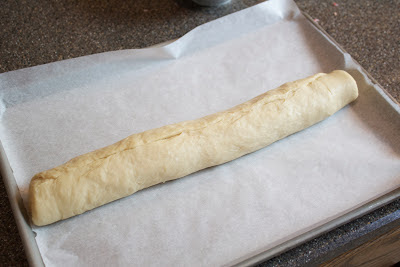 Once you've got the dough through the first rise, roll it out into a 15 x 10 rectangle. 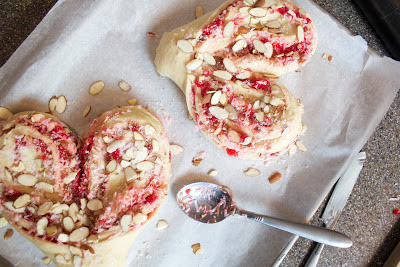 Spread with 1 tablespoon of butter. 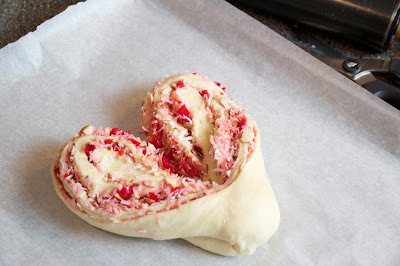 Spread the filling evenly over the top. Starting from the long side, roll up tightly and seal the edges together. Place on a pan seam side up. Fold over half of the log over on top of the other half. Seal the ends by pinching the dough together. Starting at the folded edge, cut the log in half down the center to about 1 inch or so from the end. Fold the cut edges so that they are flat on the pan forming a heart shape. In medium mixing bowl, combine yeast, 1 cup flour, 3 tablespoons sugar and salt. Heat milk, water and 3 tablespoons butter to 120° to 130°F; butter does not need to melt. Add to flour mixture. Beat 2 to 3 minutes on medium speed. Add room temperature egg; beat one minute. By hand, gradually stir in enough remaining flour to make a soft dough. Knead on floured surface 5 to 8 minutes or until smooth and elastic. Use additional flour, if necessary. Place dough in lightly oiled bowl and turn to grease top. 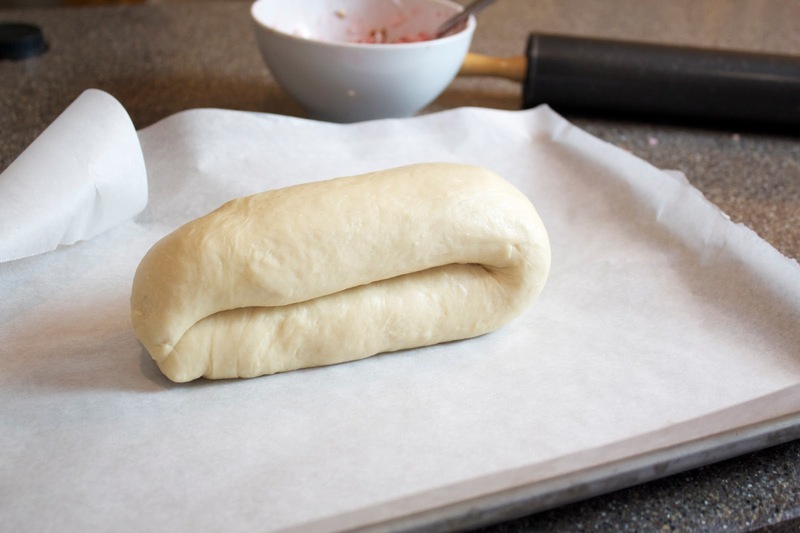 Cover; let rise until dough tests ripe, about 45 minutes. Prepare Filling by combining coconut, cherries, almonds, and sugar; set aside. Prepare Topping by combining almonds and sugar. 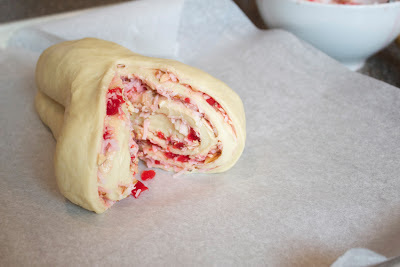 Punch down dough. 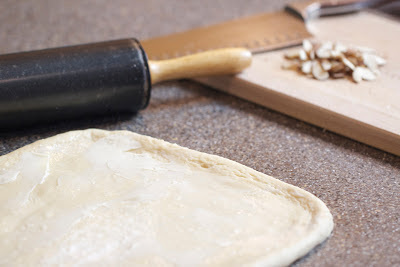 On lightly floured surface, roll dough into a 15 x 10-inch rectangle. Spread with 1 TBSP softened butter. Sprinkle with Filling. Starting with longer side, roll up tightly. Pinch edge to seal. Place seam side up on greased baking sheet. Fold half of the roll over on top of other half, sealing ends. 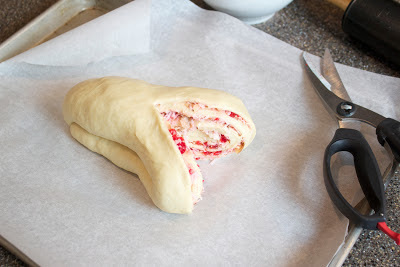 Starting at folded end, cut with scissors down center of roll to within 1-inch of other end. Turn cut halves out, cut side up, to form a heart. 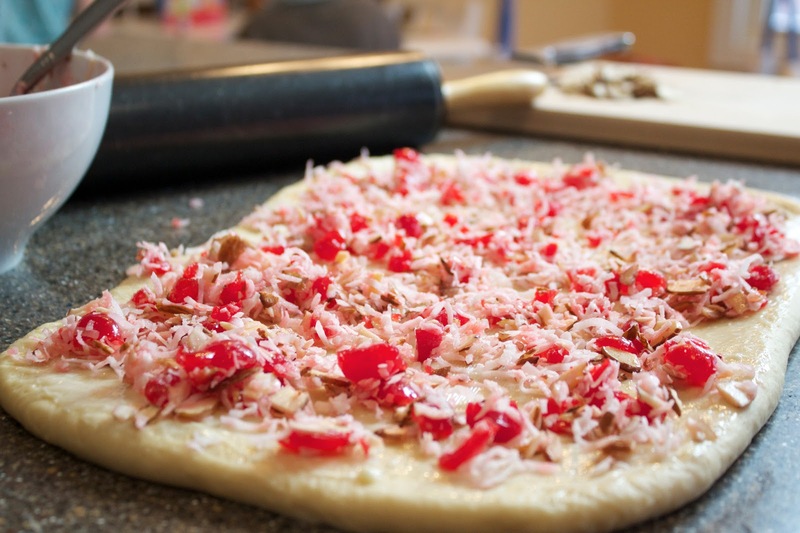 Sprinkle Topping over dough. Cover; let rise until indentation remains after lightly touching. Bake in preheated 350°F oven for 30 to 40 minutes until golden brown. Remove from baking sheet; cool. If desired, combine 3 TBSP powdered sugar with 1 TBSP water and 1/4 tsp almond extract; drizzle over coffeecake. How fun, I love the heart shape! Great how-to photos, and love that red plate! This is so creative and looks amazing!